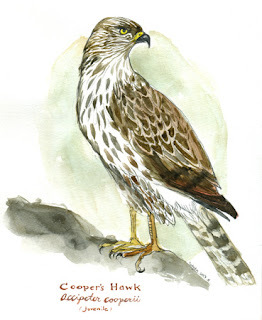 One of the Cooper's I prepared was a juvenile (depicted). It's plumage is quite different from that of an adult, which looks very close to the plumage of an adult Sharp-shinned Hawk (see following post). Cooper's used to be quite rare in the Chicago area, but are quickly becoming one of the more common hawks that you may see.